The beautiful Daria collection stands out in any bathroom with strong, clean lines and elegant raised panels. There's plenty of cabinet space, the fully extending drawers are dovetail construction, and chrome detailing completes the look. Daria deftly combines the function of today with a nod to the elegance of the past. It's the new modern classic styling with a contemporary twist. Beautiful transitional styling that complements any bathroom. Practical Floor-Standing Design. Minimal assembly required. One (1) functional door. The Emma 20 inch linen tower embraces purity of design and masterful construction. The linen tower in White finish paired with black bronze hardware brings to life the collection's simple, clean lines. Emma linen tower provides abundant storage and Zen-like functionality. Soft-close glides and hinges keep things quiet and the solid wood frame and dovetail joints keep things strong. Emma makes your bathroom beautiful. 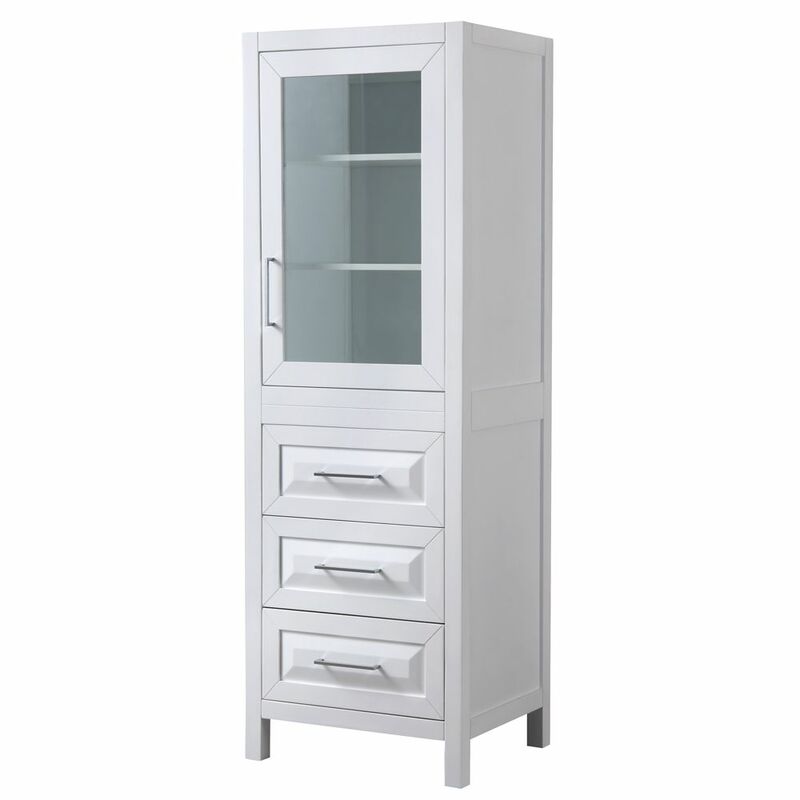 Daria Linen Tower in White with Shelved Cabinet Storage and 3 Drawers The beautiful Daria collection stands out in any bathroom with strong, clean lines and elegant raised panels. There's plenty of cabinet space, the fully extending drawers are dovetail construction, and chrome detailing completes the look. Daria deftly combines the function of today with a nod to the elegance of the past. It's the new modern classic styling with a contemporary twist. Daria Linen Tower in White with Shelved Cabinet Storage and 3 Drawers is rated 5.0 out of 5 by 3. Rated 5 out of 5 by me from Very pretty and well made cabinet. I plan to swap out the handles for brushed nickel that will c... Very pretty and well made cabinet. I plan to swap out the handles for brushed nickel that will coordinate with other bathroom fixtures. I wonder if the manufacturer could provide options for the cabinet hardware. That would be ideal. Rated 5 out of 5 by Robertrnm from Great addition to my bathroom. High quality construction and a... Great addition to my bathroom. High quality construction and a good look. Rated 5 out of 5 by Dixie from I'm well pleased with the cabinet it is well built... I'm well pleased with the cabinet it is well built and looks great in my bathroom. I would recommend the cabinet to anyone that's looking for bathroom linen cabinet. I think it is beautiful.